The Global Volcanism Program has no activity reports for Yali. The Global Volcanism Program has no Weekly Reports available for Yali. The Global Volcanism Program has no Bulletin Reports available for Yali. Yali, a small crescent-shaped island between the N coast of Nisyros and the SW coast of Kos islands, consists of rhyolitic obsidian domes and pumice deposits. It lies within the inferred location of the large submarine caldera associated with the eruption of the voluminous Kos Plateau Tuff, about 160,000 years ago, which produced extensive ignimbrites that blanket much of the western half of Kos island and which produced a caldera of uncertain dimensions but one that could extend from Kefalos Bay on the SW side of Kos to Nisyros. Yali is oriented NNE-SSW and contains two distinct segments connected by a narrow isthmus formed of modern reef sediments. The SW part of the island consists primarily of a layered pumice-fall unit about 200 m thick; the NE part contains rhyolitic obsidian lava flows of similar thickness. No historical eruptions are known, but the most recent pumice eruptions overlie soils containing pottery and Neolithic obsidian artifacts (Keller, 1982). Allen S R, Cas R A F, 1998. Lateral variations within coarse co-ignimbrite lithic breccias of the Kos Plateau Tuff, Greece. Bull Volcanol, 59: 356-377. Allen S R, Cas R A F, 2001. Transport of pyroclastic flows across the sea during the explosive, rhyolitic eruption of the Kos Plateau Tuff, Greece. Bull Volcanol, 62: 441-456. Allen S R, McPhie J, 2001. Syn-eruptive chaotic breccia on Kos, Greece, associated with an energetic pyroclastic flow. Bull Volcanol, 63: 421-432. Di Paola G M, 1974. Volcanology and Petrology of Nisyros Island (Dodecanese, Greece). Bull Volcanol, 38: 944-987. Keller J, 1980. The island of Vulcano. Soc Italiana Min Petr, 36: 368-413. Keller J, 1982. Mediterranean Island Arcs. In: Thorpe R S (ed) Andesites, New York: John Wiley Sons, p 307-326. Keller J, Rehren T, Stadlbauer E, 1990. Explosive volcanism in the Hellenic arc: a summary and review. In: Hardy D (ed) Thera and the Aegean World III, London: Thera Foundation, 2: 13-26. The Global Volcanism Program is not aware of any Holocene eruptions from Yali. If this volcano has had large eruptions (VEI >= 4) prior to 10,000 years ago, information might be found on the Yali page in the LaMEVE (Large Magnitude Explosive Volcanic Eruptions) database, a part of the Volcano Global Risk Identification and Analysis Project (VOGRIPA). There is no Deformation History data available for Yali. There is no Emissions History data available for Yali. 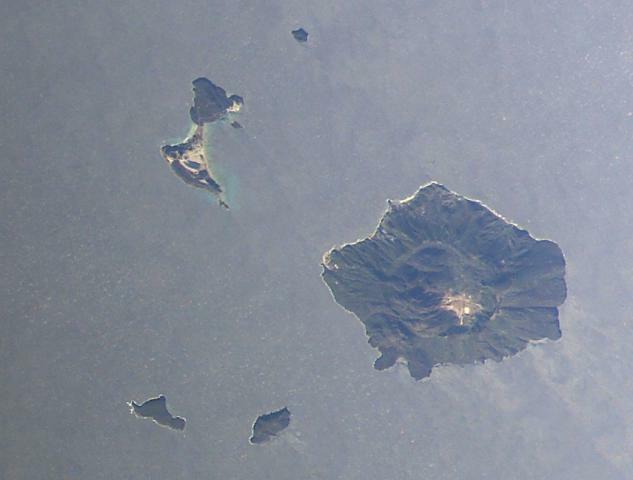 The crescent-shaped island of Yali (upper left) lies above and to the left of Nisyros Island (lower right) in this NASA Space Shuttle image (with north to the upper left). Yali contains two distinct segments connected by a narrow isthmus formed of modern reef sediments and consists of rhyolitic obsidian domes at the NE end and pumice-fall deposits at the SW end. A 3-4 km wide caldera, much of the western side of which is filled by post collapse lava domes, is visible on historically active Nisyros Island. NASA Space Shuttle image ISS006-E-30975, 2003 (http://eol.jsc.nasa.gov/). There are no samples for Yali in the Smithsonian's NMNH Department of Mineral Sciences Rock and Ore collection. IRIS seismic stations/networks Incorporated Research Institutions for Seismology (IRIS) Data Services map showing the location of seismic stations from all available networks (permanent or temporary) within a radius of 0.18° (about 20 km at mid-latitudes) from the given location of Yali. Users can customize a variety of filters and options in the left panel. Note that if there are no stations are known the map will default to show the entire world with a "No data matched request" error notice. Large Eruptions of Yali Information about large Quaternary eruptions (VEI >= 4) is cataloged in the Large Magnitude Explosive Volcanic Eruptions (LaMEVE) database of the Volcano Global Risk Identification and Analysis Project (VOGRIPA).